A new arrival from Snowmass in 2013 this is another male of outstanding phenotype with his superbly balanced body, tremendous strength of frame and substance of bone. 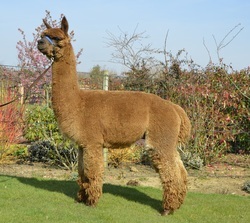 Beautiful to look at with an ideal head type and outstanding fleece coverage, he carries a bright, dense fleece with the uniformity of micron and style we have sought to keep at the forefront of our breeding programme. Soft handling with excellent staple length he is another male producing a heavy cutting fleece with an outstanding commercial value. 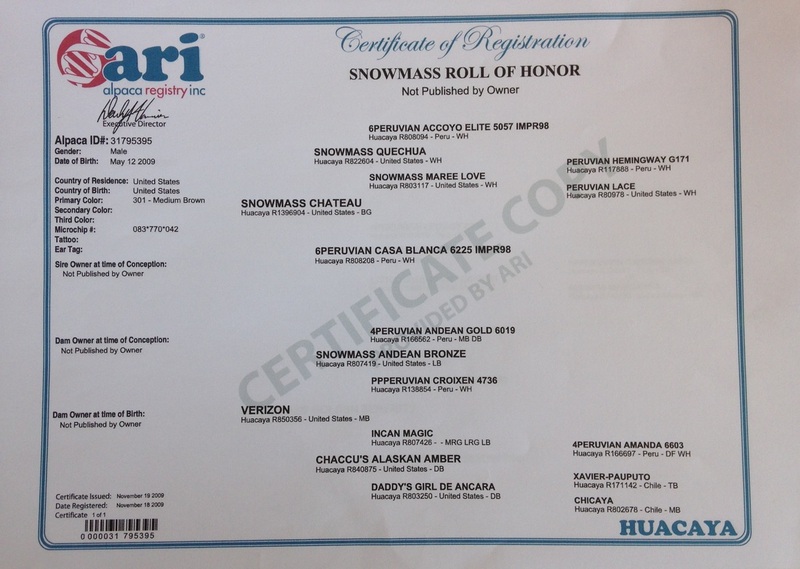 Look at his pedigree below and you can see a depth and consistency of genetics, including the great Snowmass Quechua, that will in one breeding offer consistency of results, but as importantly, an unrivalled pedigree in the resultant offspring no matter the provenance of the dam. We see him as a key factor in the development of our own coloured breeding programme, using him over our whites he is successfully pulling solid colours out with show quality fleeces. We are now approaching our birthing season and hope to get more beautiful colours from him.